Winter is with us again! For some winter is a time to curl up in front of the fireplace with a mug of hot chocolate, feeling all warm while it's freezing outside. But for others it's a time to show off the new fashion trends and designer labels! Some may say that summer fashions are hotter than winter ones, but they are sooo wrong! Winter may not be a time to show off your assets in a bikini, but nothing beats a fur coat, whether it's real or fake. Faux fur has become such an important part of fashion. One can easily find a piece for a lower price that will look even more gorgeous than the real thing! The colours one should go for are mostly black, grey, and brown because they are the traditional hues for winter coats, but no one said you couldn't wear other colours, like red, pink, or even white, to show off your coat even more! Other styles include animal print coats or bright plaids. A recent fashion alert is that military coats are back! Varying in colours and styles, nothing can beat having a military coat in your closet! Debenhams faux fur trim long coat is available for $166.431. Merona trench coat available for $39.99 at www.target.com or your local store. As far as shoes are concerned, ankle high boots are a must have, and they're definitely the season's hottest accessory. For this winter season tassels and ruffles are definite must haves on shoes. This stylish pair of Report Signature "Durant" Heel - Leopard Booties is one of winter's hottest items! As you can see there is a magnificent colour in these boots, and they can really make an outfit look chic. The animal print in these boots makes them even more stunning and eye catching. Durant heel is available for $196.00. Skinny jeans are not a winter fashion trend anymore - they are an impeccable definite must have! They are stylish, yet comfortable, for both daytime and nighttime use. Fabrics range from coloured cotton/lycra to denim, the traditional jeans material. Colours range from the lightest shade of beige to the darkest shade of mauve. Animal prints and also checkered prints are always in trend as well. Frayed skinny jeans available for $24.80 at www.forever21.com or your local store. Darted skinny jeans available for $27.80 at www.forever21.com or your local store. And who can forget the arm candy? Everyone knows what I'm talking about. Bags, of course! 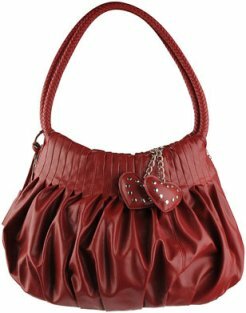 Pleated love handbag available for $22.80 at www.forever21.com or your local store. As the saying goes, "Save the best for last", and who can fail to mention Accessories, one of winter's most fabulous fashion trends?! Purple is the colour to be seen in this winter, whether it's gorgeous accessories, from diamond rings to pearl necklaces and bracelets to accent your beautiful gala dress. From custom jewelry to jewelry that costs a fortune, these fabulous pieces of art can either dress an outfit up or dress it down. 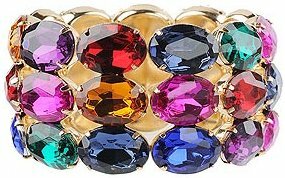 Bracelet available for $7.80 at www.forever21.com or your local store.